One of the biggest mistakes that can be made in patient recruitment is not tracking the results and putting that information to good use. Trial sites can use analytics data to justify their timelines and budgets. Armed with the knowledge of what works and what was a misstep, clinical trials can plan what is likely to work and not work in future patient recruitment efforts. Taking stock of your success and failures and adjusting future strategies accordingly can greatly increase the efficiency (and patient populations) of your trials. As we previously covered in this series, without proper tracking and analyzing of your goals, the strategy or objectives of your patient recruitment campaign will suffer. Tracking progress and analyzing results is crucial for your practice to see improvement and benefit from outreach efforts. Careful analysis will show you what content is working, what isn’t, channels in which you could improve and channels in which you are thriving. Take this information to heart and use it to make better-educated decisions with your patient-focused content. Communication needs to be open and transparent within teams and across study sites. It’s very important to be open about what is not working, identify ways to improve strategies and focus on what is working. Patient recruitment success is a team effort. It is important for everyone involved to understand the goals that are to be reached and the actions that need to be taken to do so. This clear cut plan of action will define performance metrics and establish appropriate parameters that let everyone know the range in which they should deliver. In addition to your outreach strategy, another area that needs to be closely analyzed is that of the patient follow-up procedures. Once patients are referred to a study site, it is critical that they are quickly contacted by the site for additional evaluation and possible enrollment in the study. Clarity, communication, and accessibility are key. Online tools should be utilized at each site to track the patient progression from referral to enrollment. Online portals provide study sites with a view of the patients referred to their site and provide details on overall enrollment success. Like all elements of your strategy, patent follow-up needs to be monitored and documented to identify ALL patterns (both good and bad). Are patients failing to commit with follow-up visits? What is holding them back? What can be changed to ease the process and improve patient response? To avoid future difficulties with follow-up, you may want to alter your strategy to exclude patients from the trial that (based on your research) will be unlikely to comply with the requirements of the trial. For example, individuals without a fixed address or those who express uncertainty about participating may be difficult to retain for the entirety of the trial. Closely monitoring the successes and missteps of your patient recruitment strategy will provide you the opportunity to make necessary changes and continue to improve with each future clinical trial. 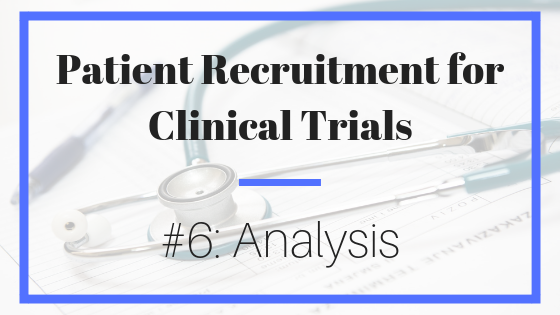 We hope you enjoyed this patient recruitment series!